DENTON – Brianna Bledsoe, Kathy Thomas and Kiara Wright combined for 41 of Tarleton’s 72 points to lead the TexAnns (4-1) back into the win column with a 72-62 victory over Central Oklahoma in the first game of the Marriott Champions Circle Pioneer Premiere. Wright recorded her first double-double in three games with 16 points and 14 rebounds. She hasn’t gone three straight games without a double-double since her sophomore season. She moved into 11th place on Tarleton’s all-time scoring list and is now four points away from moving into the top 10 in school history. Bledsoe, the reigning LSC Offensive Player of the Week, led the team with 20 points, highlighted by a perfect 7-7 afternoon at the charity stripe. Thomas also poured in 15 points on 4 for 6 shooting from the floor, 2 for 3 from downtown and 5 for 6 from the free throw line. Rounding out the Tarleton scoring was Morgan Ashmore (6), Shanae Lowrance (5), Meagan O’Dell (5), Karli Moore (4) and Ikpeaku Iwobi (1). The TexAnn defense stifled the UCO 3-point offense, holding the Bronchos to 5 for 30 (17 percent) from beyond the arc. They came in to the game shooting 37-percent from downtown. 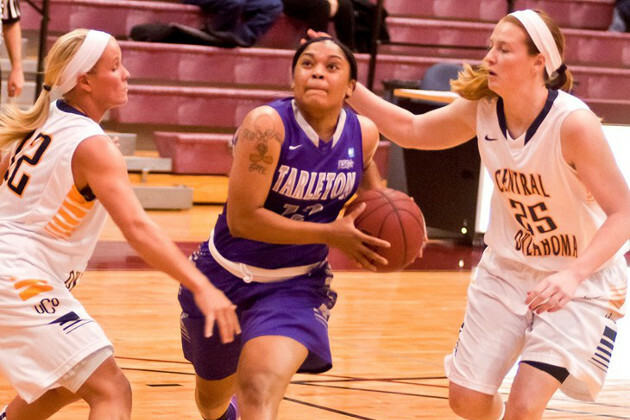 Tarleton has one more game in Denton as they will play in-region foe, Regis University, Sunday afternoon at 12 p.m.